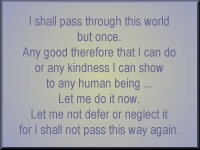 I have a plaque that I occasionally give to friends to remind them they might only have one chance to show kindness to someone they don't know. One chance to make a friend that might last a lifetime. The thought goes to you, because you are one of the few people I've met that lives the words.
. . . truly an award for achievement in Web site design. All that I ask is that you tell 1 person about my site and teach 1 person a little something about Web Design. There's something on each site worth seeing  eye-grabbing graphics, or an unusual site premise, or neat use of HTML or new web technologies, or offbeat topics, or rich resources  tons of stuff. I am pleased to inform you that your web site has been chosen because of its terrific design and unique content as a winner. Congratulations on your excellent work! Is it possible for a person to dream that he is having a dream in which he is dreaming?